Kids - Michelle’s Craft Basket - Gifts, Favors, Accessories and More! Michelle’s Craft Basket - Gifts, Favors, Accessories and More! 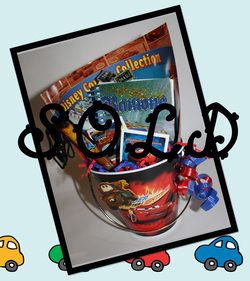 This tin bucket, decorated with Lightening McQueen holds all sorts of goodies for your young fan! On the outside, there is a Tow Mater magnet. Inside, you will find "The World of Cars Disney Comics Collection," a Ramone Spiral Bound Notebook, a Tow Mater pen with a Rope, and a number of stickers (some of which are glittery), showing the different characters! Your little princess will love this Disney Princess School Basket! 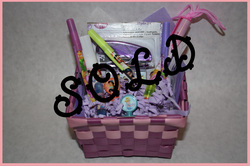 The pink basket includes "The Princess and the Frog" Purple Stapler with staples, a Disney Princess Glue Stick, a "Princess Aurora" pen on a rope, three Disney "Fairy" ballpoint pens, a "Snow White" and a "Little Mermaid" double-sided stamper, and a "Princess Jasmine" and "Cinderella" stamper. Your little princess will love this Disney Princess Beauty Mini Box! The pink box includes a Disney Princess Comb and Mirror Set and a Glitter Lip Gloss. Your little princess will love this Disney Princess Blue Mini Box! The box includes a Disney Princess Glue Stick, a "Cinderella" pen on a rope, a Disney "Fairy" ballpoint pen, a "Princess Jasmine" and a "Princess Belle" double-sided stamper, and a "Snow White" and "Princess Aurora" stamper. Your little princess will love this Disney Princess Pink Mini Box! The box includes a Disney Princess Glue Stick, a "Princess Jewels" pen on a rope, a Disney "Fairy" ballpoint pen, a "Princess Aurora" and a "Cinderella" double-sided stamper, and a "Princess Ariel" and "Princess Belle" stamper.